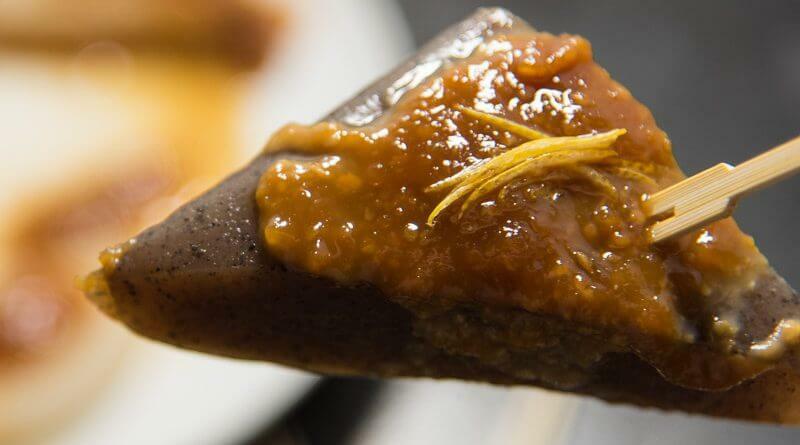 Miso dengaku is a Japanese miso glaze that is packed with flavor. It’s characteristically bold thanks to a heavy miso component. And it get’s a boost from several flavor enhancers like sake, mirin, sugar and other ingredients depending on the recipe. Miso dengaku is sweet and salty, but I like to make it a little bit on the saltier side. How about you? It goes extremely well on tofu and some of my favorite vegetables like eggplant and daikon. 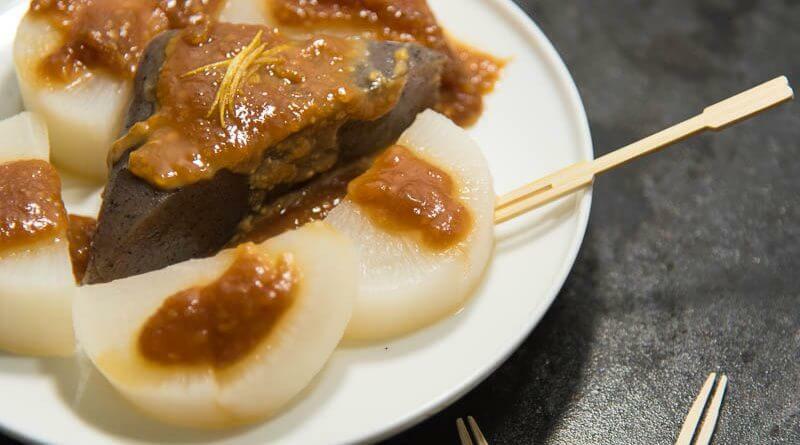 But it’s quite versatile and you can use it on many other things like scallops, pork, potatoes and even oden. If you aren’t sold yet, and you’ve never tried miso dengaku. 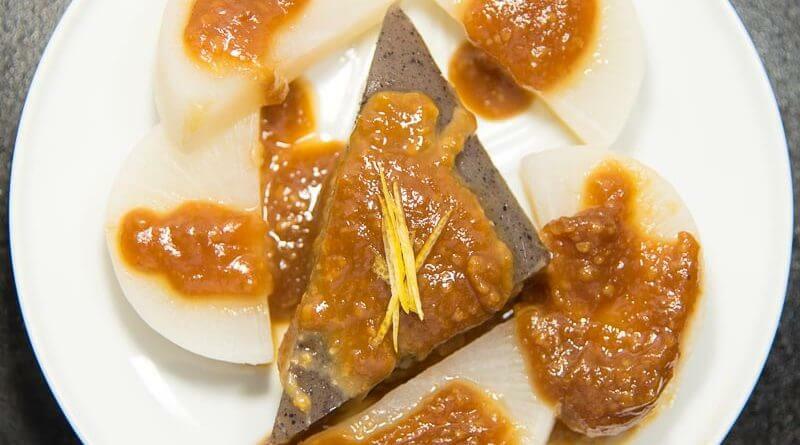 This and eggplant (nasu dengaku– [version 2 will be posted soon]) are good options to get started. Next time I’ll make it with tofu which is my absolute favorite. 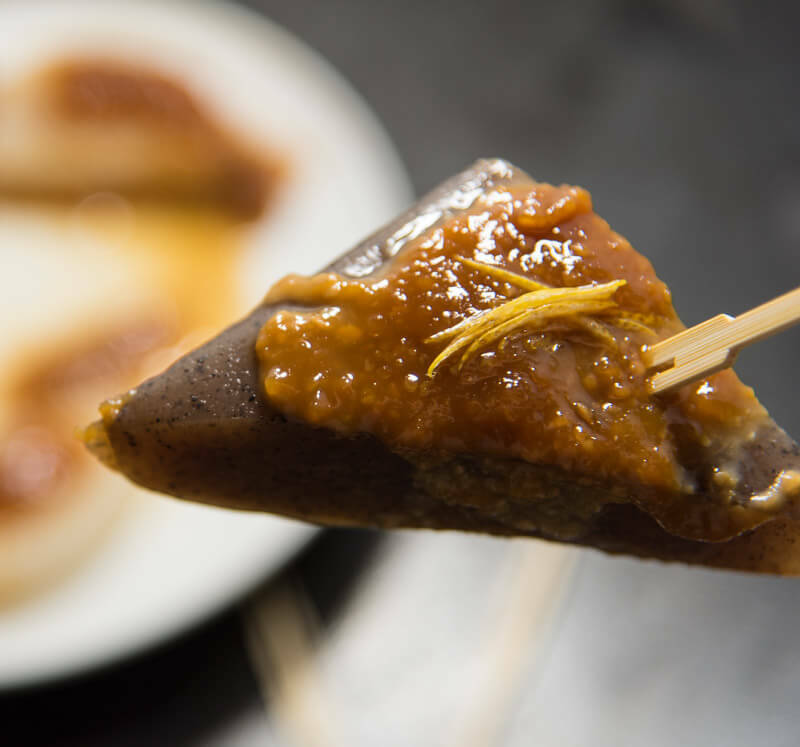 The konnyaku triangles don’t have much flavor on it’s own, so it’s the perfect vehicle to eat the miso dengaku glaze. The konnyaku is the block form of shirataki noodles which are both made from the same thing. Shirataki noodles can be used in various dishes like sukiyaki or shabu shabu. Taking konnyaku out of the package is probably most unpleasant part about preparing this dish. It always has a funky smell, but with a quick rinse and after cooking you won’t even notice it. Plus it’s a negative calorie food. That means you burn more calories digesting it, than you absorb from it. Know another vegetable that is negative calorie? Celery! For this recipe, I lightly seasoned the daikon and the konnyaku with half-strength dashi stock and a little soy sauce. If you want a stronger flavor, you can use full strength dashi. That’s the freedom of cooking at home! However, I think the dengaku glaze has plenty of flavor so that is why I go with less seasoning. Did you know daikon flavor varies depending on the season? During the winter it’s sweeter, and summer more bitter. The way that you cut the daikon can also affect the bitterness. Apparently, if you cut length wise (with the grain) the flavor will be less bitter as you are cutting with the grain. Cutting with the grain on daikon means you’re cutting with the fibers that extend up/down and breaking less cells. Breaking less cells means less allyl isothiocyanates and equals less bitter daikon. I precooked each slice of daikon in togijiru (とぎ汁) for about 20 minutes. Togijiru is the rinse water that you can collect when rinsing rice. I make sure to put in roughly 4 cups of water and agitate the rice to get as much of the starch into the water on the first rinse. Then I strain the rice rinse water into a 4 cup pyrex. Togijiru should be milky white and contains all those rice starches that you don’t want on your rice. It helps to not only keep the daikon white, but also remove some of the bitterness daikon can sometimes have. Togijiru can also be used to remove the garlic smell from your fingers and cosmetically to moisturize your face. Makes you think twice about throwing rice rinse water down the drain now, doesn’t it? 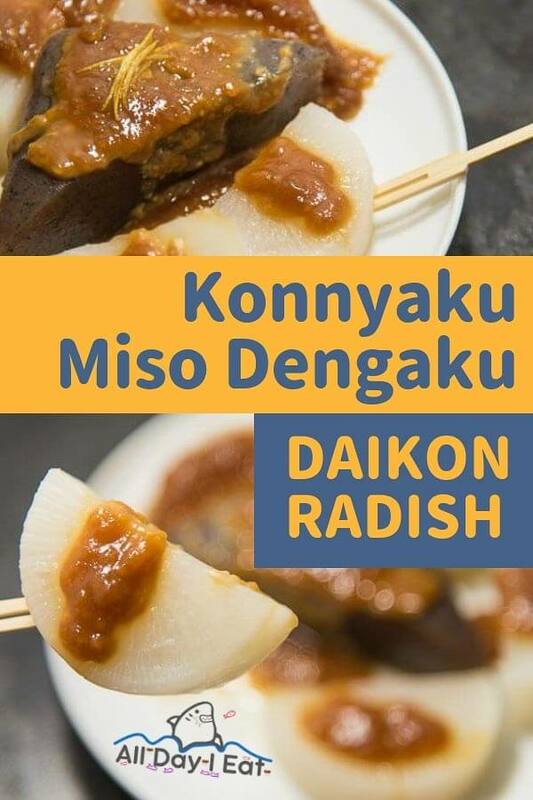 Watch the live replay video below to learn how to prepare three different dishes using miso. Join me tomorrow, Wednesday, for live Japanese cooking on Youtube at 5PM PST! Add 4 cups togijiru to a pot and bring to a boil, add daikon in and cook roughly 20 minute until you can easily pierce with a chopstick. Prepare 2 cups of dashi, at half strength and add a 1 tsp of soy sauce. Bring to a boil then simmer. Add in the daikon and konnyaku and cook for 3-5 minutes . Strain konnyaku and daikon from the pot and place on a serving plate. Mix all the ingredients under miso dengaku in a bowl. Add to a small saucepan and heat on low heat for 3-5 minutes until slightly thickened. 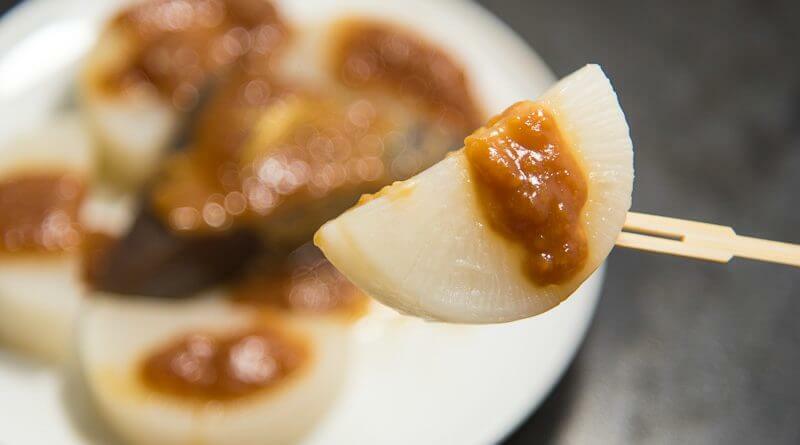 Once at the desired thickness remove from heat and immediately spread on konnyaku and daikon. 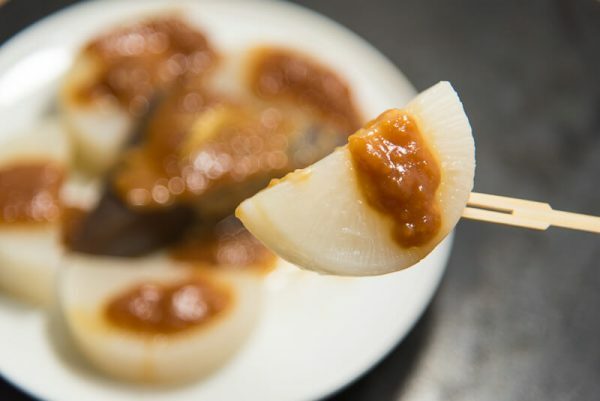 If you want very round shaped daikon pieces, use your knife to peel and smooth the sharp corners/edges, as you would peel the skin off an apple. It's easier to do this before slicing, when the daikon is one big piece. To enhance the flavor of the daikon, I lightly scored both sides of each slice. This helps the daikon slices to absorb the dashi soy sauce flavors from the broth the second time we cook it.